THE WORLD IS FULL OF LOVE, WAR AND MAGIC! In a world of glory and treason, three strangers come together. One is born to lead his country, one to battle for England's soul, and one to preserve its magic. 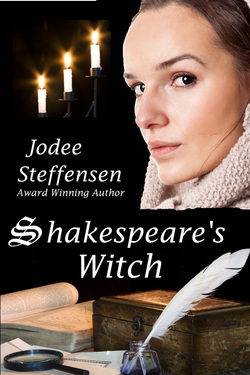 SHAKESPEARE'S WITCH - a journey through Shakespeare's time with all it's romance and intrigue. The complete story of three unlikely friends who risk their lives, fortunes and honor for each other and for England. Beatrice, accused of witchcraft, must choose between Henry, the dashing, wealthy Earl of Southampton, or William Shakespeare, the passionate poet and a leader of the Catholic resistance. Can Beatrice protect Shakespeare if she gives her heart to the Earl? Shakespeare's Witch was also available in three parts:, though they have since been retired. If you'd like to purchase one of these limited editions, contact me at jodee.steffensen@gmail.com or you can still purchase them at Weller Books in Trolly Square! I'm a writer and teacher who loves science and history. I'm thrilled that my favorite hobbies and past experience have finally combined to produce a series of books called "Shakespeare's Witch." I'm also a retired teacher and preventing bullying has been a huge focus in my career. I began a series of books to share with my students that addresses this important subject. They're now available for you! You can email me at jodee.steffensen@gmail.com. You can also visit my amazon author's page!